To Cite: Mohamadkhani A, Besharat S, Gol-Jah Rad G, Pour Dadash Asiabar A, Roshandel G, et al. Higher Serum Levels of Type I Interferon Receptor in Adults with Chronic Hepatitis B Leading to Hepatitis B Surface Antigen Clearance, Jundishapur J Microbiol. 2017 ; 10(3):e41319. doi: 10.5812/jjm.41319. Background: Loss of hepatitis B surface antigen (HBsAg) in chronic hepatitis B (CHB) infection is a favorable outcome. Type I interferon (IFNI) has an essential role to fight virus infections when they bind to the IFN-α/β receptor (IFNAR). Free-circulating IFNARs, known as IFNAR2, perform as carrier proteins to keep the ligands from proteolysis as well as antagonists for ligand binding. Objectives: In this study, we evaluated the HBsAg titer and IFNAR2 in serum baseline of a subcohort of Iranian HBeAg-negative patients with chronic hepatitis B. Methods: Sixty-four patients who spontaneously cleared HBsAg and 100 chronic hepatitis B patients enrolled in this study for assessment of the serum levels of HBsAg and IFNAR2. Results: Serum levels of HBsAg and IFNAR2 were both powerfully associated with loss of HBsAg. The baseline HBsAg titer was significantly lower (333.72 ± 1300 IU/mL vs 3811 ± 6779 IU/mL, P = 0.00) and the IFNAR2 serum level was significantly higher (1.64 ± 0.6 vs 0.87 ± 0.5 ng/mL, P = 0.00) in those who cleared HBsAg compared to the CHB patients. Conclusions: These findings indicated the association of the HBsAg titer and serum IFNAR2 in HBsAg clearance in hepatitis B virus- infected patients. In consequence, immune mechanisms related to IFN-α/β signaling might be responsible in CHB outcome. Chronic hepatitis B (CHB) is one of the main causes of developing cirrhosis, liver failure and hepatocellular carcinoma worldwide. Presence of hepatitis B surface antigen (HBsAg) in the serum is an important marker in the diagnosis of CHB infection. Consequently, HBsAg clearance is an extremely favorable event in the course of CHB. Therefore, great attention has been paid to find determinants of spontaneous HBsAg clearance (1-3). Previous studies have shown that certain factors such as older age, female gender, HBeAg-status, the normal alanine aminotransferase (ALT) level, lower viral load and genotypes B compared to C or A compared to D are associated with the spontaneous clearance of serum HBsAg (4, 5). Patients with lower serum level of HBsAg are more prone to spontaneous clearance of HBsAg. This reflects an immunological control of the infection with both humoral antibody responses to hepatitis B virus (HBV) envelope antigens for neutralizing the virus as well as cell-mediated immunity eliminating HBV-infected cells in a noncytopathic pathway (3, 6, 7). Type I interferons (IFNIs), known as IFN-a/b, make the first line of innate immunity in response to host defense against viruses and exclusive intracellular pathogens (8, 9). Type I interferons are produced by macrophages, epithelial cells, and dendritic cells that involved in proinflammatory responses, antiproliferative induction and antiviral defense mediated by signaling through the type I IFN receptor (IFNAR) (9, 10). Plasmacytoid DCs (pDCs) that are derived from bone marrow are specialized for IFNIs production (9, 11). However, the numbers of circulating pDCs in chronic hepatitis B or C viruses are decreased in an IFNI-dependent apoptosis pathway (12). The IFN-α/β receptor structurally has two heterodimer subunits named IFNAR1 and IFNAR2. An alternative splicing proceeding IFNAR2 gene that is located on human chromosome 21q22.1 encodes two isoforms of soluble and membrane-anchored IFNAR2 proteins (9, 13). The soluble receptor has been demonstrated as an important regulator of IFNI (13). The function of IFN- α/β that is more expressed in CHB infection is suggested to be modulated by soluble IFNAR2 as an important regulator of both endogenous and systemically administered type I IFNs (14). Therefore, IFNAR2 could influence the immune mechanisms of HBV infection clinical outcome (6, 11, 15). This study aimed at determining factors related to the HBsAg seroclearance including viral markers and the soluble IFNAR2 in a group of asymptomatic untreated HBeAg-negative CHB patients with genotype D.
This study was conducted within the Golestan hepatitis B cohort study (GHBCS) (16), a subcohort of 3505 HBsAg-positive individuals within Golestan cohort study (GCS) (17), which originally intended to study the upper gastrointestinal cancers among subjects older than 40 years in northern Iran between 2004 and 2008. After a mean follow-up of 5 years, 2590 HBsAg-positive subjects were available for visit and blood sample collection. They were reassessed for HBV infection serological markers. Using baseline (initial) blood samples, we run this study within GHBCS: with 64 individuals who spontaneously cleared HBsAg (as a case group) and 100 treatment naive HBV-infected individuals, with no evidence of other liver disorders (as a control group). Figure 1 showed the experimental design of this study in a diagram. Spontaneous seroclearance of HBsAg was defined as losing HBsAg and developing antibody for hepatitis B surface antigen (HBsAb) after years of being HBsAg-positive with undetectable HBV DNA. The study was approved by the ethics committee of digestive disease research institute, Tehran University of Medical Sciences. Informed consent was also obtained from all participants or their guardians. Serological markers in HBV infection were measured by the standard qualitative enzyme-linked immunosorbent assay (ELISA, Diapro, Italy). The serum HBsAg titer was quantified using electrochemiluminescence assay (Roche Diagnostic, Germany) and was reported as IU/mL, with a dynamic range of 0.05-250 IU/mL. Hepatitis B virus DNA was extracted in patients’ serum by the high pure viral nucleic acid kit (Roche Applied Science, Germany) and quantified in the Light-Cycler (Roche Diagnostics, Mannheim, Germany) using RealArtTM HBV LC PCR (QIAGEN, Hilden, Germany) based on manufacturer’s instructions, with a lower detection limit of 10 IU/mL. The serum level of IFNAR2 was measured using the human IFNAR2 ELISA kit (Cloud-Clone Corp. Houston, USA). For continuous variables, mean and standard deviation (SD) were calculated. Frequency and percentage were used for categorical variables. Association between baseline characteristics and HBV clearance was tested using the t test or chi-squared test properly. The variables HBV DNA, HBsAg and INFAR2 were logarithmically transformed for the Pearson’s correlation analysis. For each three factors, odds ratio (OR) and 95% confidence interval (CI) were calculated based on the multivariable logistic regression. Receiver operating characteristic (ROC) curve analysis was used to compute the area under the ROC curve (AUROC) for HBsAg and INFAR2 levels. Preferred cut-offs for these two factors were determined based on maximum classified probability. Sensitivity, specificity and 95% CI were calculated for obtained cut-offs. One hundred and sixty-four patients infected with HBV (64 cleared HBsAg after 5 years of follow-up and 100 randomly selected patients with CHB) with a mean (SD) age of 58.44 (8.4) years were enrolled in the present study (Figure 1). The demographic and laboratory characteristics of the included participants are summarized in Table 1. Age, gender and body mass index (BMI) did not differ significantly between cases and controls. There was no difference in the mean (SD) of the log10 HBV DNA level between those who cleared HBsAg and the CHB group (2.4 ± 0.8 IU/mL vs 2.6 ± 0.66 IU/mL, P = 0.113). Abbreviations: BMI, Body Mass Index; CHB, Chronic Hepatitis B; F, Female; HBsAg, Hepatitis B Surface Antigen; HBV, Hepatitis B Virus; IFNAR2, Interferon-α/β Receptor 2; M, Male; NS, Nonsignificant. aValue are expressed as Mean SD. The baseline mean (SD) HBsAg titer was significantly lower in those who cleared HBsAg compared to the CHB patients (333.72 (1300) IU/mL vs 3811 (6779) IU/mL, P = 0.00), while the level of IFNAR2 was significantly higher (1.64 (0.6) vs 0.87 (0.5) ng/mL, P = 0.00) (Table 1). There was no association between HBsAg clearance with age, gender ratio, HBV DNA level and BMI. However, there was a positive correlation between the titer of HBsAg and HBV DNA level in the serum baseline of total samples that this correlation was affected more by HBsAg-cleared group (r = 0.21, P = 0.004 and r = 0.22, P = 0.068). The odds ratios and P values for factors predicting the clearance of HBsAg are outlined in a multivariate model in Table 2. After adjusting for age, gender and BMI, the multivariate regression analysis revealed that serum levels of IFNAR2 (OR = 12.8; 95%CI: 5.27 - 30.97) and HBsAg titer (OR = 0.99; 95%CI: 0.99 - 1) were the strongest variables related to the clearance of HBsAg. Abbreviations: CI, Confidence Interval; F, Female; HBsAg, Hepatitis B Surface Antigen; HBV, Hepatitis B Virus; IFNAR2, Interferon-α/β Receptor 2; M, Male; OR, Odds Ratio. The areas under the ROC of HBsAg and IFNAR2 to identify HBsAg seroclearance were 0.83 (95% CI: 0.77 - 0.89, P = 0.000) and 0.85 (95% CI: 0.78 - 0.91, P = 0.000), respectively (Table 3). Considering a cut-off of 194 IU/mL, the HBsAg titer had a sensitivity of 70% and a specificity of 83% to determine the clearance. 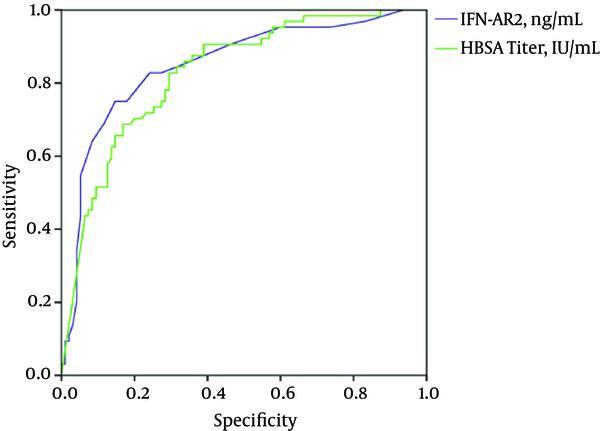 The sensitivity and specificity of IFNAR2 (≥ 1.3 ng/mL) for HBsAg seroclearance were 85% and 75%, respectively. These results showed that a combination of the HBsAg titer (≤ 194 IU/mL) and IFNAR2 (≥ 1.3 ng/mL) could predict the HBsAg clearance in HBV-infected patients in our area with a very good sensitivity (97%) (Figure 2). Abbreviations: CI, Confidence Interval; HBsAg, Hepatitis B Surface Antigen; IFNAR2, Interferon-α/β Receptor 2. Here, we presented a long-term follow-up study in chronic hepatitis B patients from GHBCS (16). From the 2590 chronic hepatitis B patients in a community-based sample of the HBsAg carrier, we demonstrated that 64 subjects spontaneously cleared serum HBsAg. This shows shows the annual seroclearance rate of 0.5% per 100 people per years, lower in western studies, but remarkably similar to earlier from from eastern countries such as Korea, and Taiwan with the HBs clearance rate 0.5% per year and a rate of 0.7% in a population-based study of Alaska native peoples (18). Overall, some patients lose HBsAg in the inactive phase and seroconvert to HBs antibody after years of being HBsAg-positive (19). The mechanism associated with this occurrence and how they are related to the clearance of HBsAg has not been elucidated well. However, older participants with longer periods of inactivity of HBV infection are more prone to HBsAg clearance through activation of immune response (1, 20). In this longitudinal study, the baseline serum level of HBsAg and IFNAR2 were evaluated in untreated chronic hepatitis B patients with HBeAg-negative. Both serum HBsAg level and IFNAR2 had significant effects on clearance of HBsAg. Our results revealed that the HBsAg titer was independently associated with HBsAg clearance that was significantly lower in subjects who cleared HBsAg during follow-up. Effects of HBV viral load have been examined in previous studies and indicated an association between HBsAg seroclearance and lower HBV DNA levels (4, 5, 21). Also, they showed that serum HBsAg and both serum and liver HBV DNA were more correlated in HBeAg-positive carriers. However, this correlation was absent in HBeAg-negative patients (22). Quantitation of HBsAg represents not only the production of virions, rather the existence of defective forms of spheres and filaments of HBsAg particles (9). In our study, those who spontaneously cleared HBsAg had lower baseline levels of HBV DNA compared to the controls, though it was not significant. However, there was a correlation between the serum baseline HBsAg titer and HBV DNA level in this group, which indicated the constructing of HBsAg from cccDNA rather than integrated HBV DNA and thought to decrease over time before spontaneous clearance (2, 20). Also, the results of the present study showed that the serum level of IFNAR2 receptors was significantly higher in spontaneously cleared HBsAg subjects than in chronic hepatitis B. Higher expression of the IFN receptor has been reported in viral hepatitis-infected hepatocytes in liver in comparison with the normal liver tissue (23). Likewise, Zhao et al. (24) showed that the mRNA and plasma levels of IFNAR1 and IFNAR2c were increased in CHB and liver cirrhosis patients compared with healthy controls. Soluble IFNAR2 is an important regulator of endogenous and systemically administered of type I IFNs (9, 25, 26). Interferons-α/β are virus-interfering factors that involved in both immunostimulatory and immunosuppressive properties (27). They generally remain in serum in low concentrations at normal conditions for autocrine or paracrine activities, but increase up to even 1000 IU/mL in viral infections (28). There are several possible mechanisms by which soluble IFNAR2 might regulate the IFN-signaling pathway. Recent investigation has shown that increased IFN-α/β in young mice initiates an immunosuppressive signaling cascade in the hepatocytes and pDCs through tyrosine kinase receptors, in addition to the induction of IL-10 and Treg cells, resulting in decreased antiviral functions in younger mice (11, 15). Even though these soluble cytokine receptors have been considered as antagonists for transmembrane forms of the receptors, they also perform as carrier proteins to increase the stability of type I IFNs ligands by keeping them from proteolysis and clearance. In this way, they are agonists for modifying ligand activity in a trans-signaling pathway (6, 9, 25, 26). On the other hand, it has been demonstrated that the numbers of pDC are decreased in the IFNI-dependent proapoptotic manner in viral hepatitis (9). Plasmacytoid DCs are key cells that have been implicated in both innate and adaptive immunity through expression of major histocompatibility and costimulatory molecules, as well as the production of IFNI (9, 29). Therefore, the potential role of soluble IFNAR2 in modulation of IFNI signaling and the consequent apoptosis of the pDC needs to be clarified. Our study had minimal limitations. First, 100 randomly selected patients with CHB could be divided into those who remain inactive HBsAg carriers with immune control of HBV replication and absence of chronic hepatitis B and chronic hepatitis B patients (stratified as untreated and treated with antivirals). However, because of absence of the liver enzyme ALT and platelet count in baseline samples that is the second limitation having separate groups was not possible. We wish to thank the directors of the public health districts of Gonbad and Kalaleh, the Behvarz working in the study areas, the social security organization of Iran (Golestan Branch), the Golestan health deputies and the chief of the Gonbad health district. We would also like to thank Keivan laboratory for technical support. This work was supported by the digestive disease research institute, Tehran University of Medical Sciences (grant no. 15648). Authors of this article also take this chance to appreciate all patients who participated in this research program. Authors’ Contribution: All authors contributed both to the research and the discussion and they have read and approved the final manuscript. Funding/Support: This work was supported by digestive diseases research institute, Tehran University of Medical Sciences, Tehran, Iran.